Forget about outside, it's the tropics in your bathroom. Lemongrass and ylang ylang combine for a bliss-inducing aroma. If big, luscious bubbles that smell fresh and fruity are your buzz, then Kahuna Bubble Bath is for you for you! Kahuna is a clean, green bubble bath made with gentle coconut-based suds and pure organic essential oils. The bubbles last forever and it only take a tablespoon to create a luxury bathing experience. Great for sensitive skin and children. Follow with a luxurious body lotion that smells like tropical paradise with fresh lemongrass, flowery ylang ylang and sweet coconut. 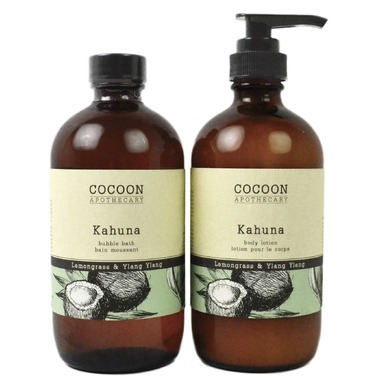 Super-hydrating and fast-absorbing, the Kahuna Body Lotion locks in moisture with the nourishing oils of virgin coconut and macadamia nut. Treat yourself to a trip to the tropics every time you moisturize. Kahuna Bubble Bath Ingredients: Coco glucoside (from coconuts), water, organic glycerin, organic lemongrass essential oil, organic ylang ylang essential oil. Kahuna Body Lotion Ingredients: Purified water, certified organic virgin coconut oil, certified organic macadamia nut oil, cetearyl alcohol (wax from coconut), stearic acid, vegetable glycerin, certified organic lemongrass, certified organic ylang ylang, sodium anisate (derived from basil), sodium levulinate (derived from corn), sodium cetearyl sulfate (from coconut).